It’s no surprise that a legacy of gender disparities continues in this country. A trending and polemical conversation has been ongoing about the gap between women’s and men’s earnings for years. The gender pay gap is prevalent at each stage of women’s careers, from entry-level to executive positions. And this pattern is no different even for female athletes at the top of their game. In professional athletics, the fight for equality has been a pressing issue. The Battle of the Sexes is now streaming on HBO. The 2017 film underscores the absurd inequality in pay in professional tennis when Billie Jean King and Bobby Riggs competed in their co-ed match in 1973. Most recently, Serena and Venus Williams’ demands for equal pay at Wimbledon and the French Open led to the decision to eliminate pay disparities in tournament play. The U.S. Women’s Soccer Team has also led the way in dismantling the gender equity gaps in sports. 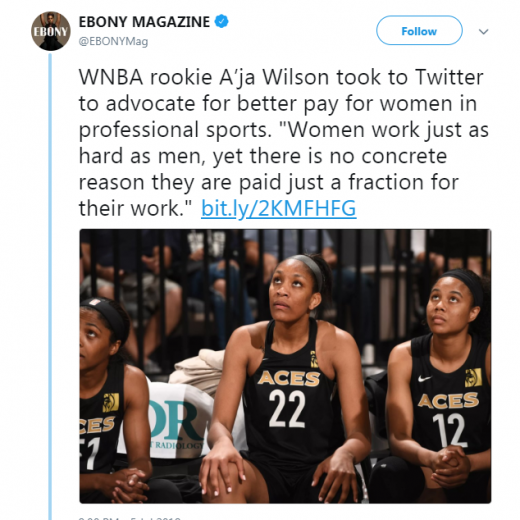 Female basketball players in the WNBA continue to voice that they earn a fraction of what their male counterparts earn. In April, South Carolina’s own A’ja Wilson was drafted to the Las Vegas Aces as the WNBA’s first overall pick. With a starting salary anticipated at $55,052, Wilson’s income is much lower than Deandre Ayton’s $6.8 million first-season earnings with the Phoenix Suns as the NBA’s No. 1 pick. Mentioning this gap often provokes critics who justify the inequality by citing differing revenues of the leagues. 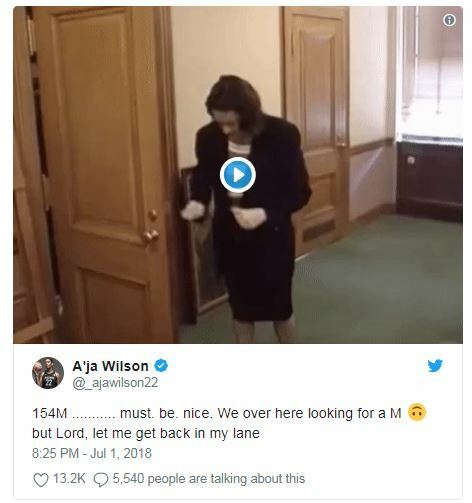 However, the WNBA operates under collective bargaining agreements which determine the relationships between the WNBA as an employer and the league’s player-employees. Under these agreements, compensation and dispute resolution are determined. The inequality originates in CBAs because WBNA players are paid a much lower percentage of revenues according to their CBAs in comparison to the NBA. The inequalities don’t just exist in the gaps in pay in the WNBA and NBA. The issue of differences in the leagues became more apparent when the Las Vegas Aces experienced travel interruptions en route to Washington, D.C. for an August 3 matchup with the Washington Mystics. The 25-hour day of travel “stretched so long the game was delayed, then canceled, and, four days later, declared a forfeit.” This would not be an issue if the WNBA chartered their own flights—which is what the NBA does—but chartered flights are too expensive for the WNBA’s budget. Traveling commercially risks experiencing travel postponements, and with the Ace’s latest heavy delay, there was no time to adequately rest and prepare for the game the following day. Withan arrival in D.C. in the afternoon, the Aces decided to call off the game due to insufficient time and preparation. Playing fatigued would have made the athletes more at-risk for serious injury, and without salaries that set them up for life like their NBA peers, choosing not to play was a safe decision. Yet, making a “safe decision” to save their bodies, careers, and futures would never have had to occur for players in the men’s league. While it’s no surprise that a legacy of gender disparities continues in this country that from its infancy has placed women on its fringes, the time is up for inequitable salaries and benefits. For those saying, “Wait your turn” or “Give it time”: no. Now is the time. The gaps have been closing in professional tennis and soccer, but the differences in professional basketball for women and men remain stark. With higher salaries, equitable financial operations for travel, flexible schedules, and a cooperative effort from the WNBA to reschedule games, the league would be more sustainable for its players. Player support is crucial in eliminating the glaring differences between the WNBA and NBA and progressing the overall fight for gender equality.